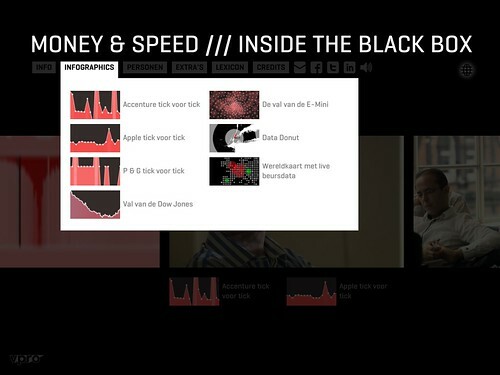 Last Tuesday Dutch broadcasting corporation VPRO launched the iPad documentary “Money & Speed” (free now in the App Store) they had been working on on and off for a large part of the past year with catalogtree (design), Noodlewerk and Systemantics (development). I was present and got an advance copy of the documentary to review here. 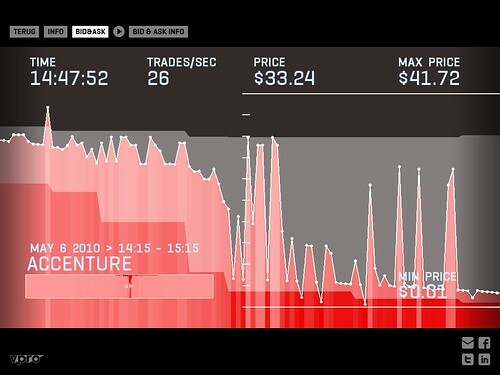 The documentary deals with the flash crash of May 6th, 2010 when the black box trading operations on Wall Street went haywire and dropped the index 900 points to recover just minutes later. I’d already read about the possibility of such events from Kevin Slavin’s January 2010 Social Computing Summit presentation which has been noted down and blogged about by Michal Migurski. Both are recommended reading. We have seen various troubles with the stock exchanges in the past year and this event especially seems one worth investigating because it exemplifies the complexity in todays exchanges and the total lack of control humans have over the process. For an international audience the concept of Tegenlicht may need some explanation. Tegenlicht is a documentary that examines world events by interviewing experts interspersing the interviews with visuals and a voice-over to create a dramatic storyline. The app contains the entire show in high quality which is in part why it is so heavy. The shelf life of Tegenlicht documentaries is quite high. For another concept we recently rewatched their 5 year old documentary ‘De dag dat de dollar valt’ (Eng. The Day the Dollar Fell) because it was still relevant and interesting. The 45 minute length with drawn out shots can be a bit taxing for today’s YouTube attention spans, but byte-sized information is not their game. TED is much better at that. They concern themselves with the documentary as a dramatic art form that needs to engross its audience. Given that concept —highly traditional television, cinema almost— it is interesting how you would interject/overlay/add interactive features into the narrative whole. This was touched upon briefly in the presentation, but that is not what this app concerns itself with. You can view the documentary and jump back and forth through the various segments while additional content is presented for your perusal. It is clear though that traditional broadcasters are still very much struggling not only with the internet but also with the spectrum of television, cell phone, laptop, iPad and the locus of interactivity (if there is any interactivity). Tweede scherm is one such recently award-winning concept that displays supplementary information to add context to the main experience on the large screen. 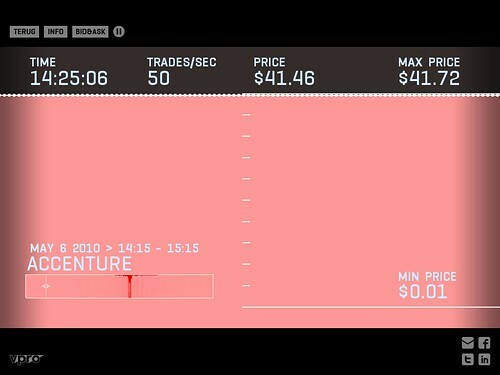 It starts out nice and flat with a display of trading velocity (not quantity) and pricing information along with the time. 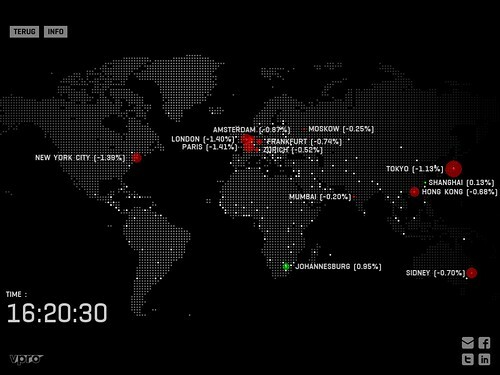 There is a global display with scrubber that you can use to navigate over the entire run of the data and the crash is nicely colour coded. The vertical scale is a bit confusing as the one above does stop at zero (and then goes on for a bit more) but the other ones don’t. So confusing in fact that in the documentary one woman remarks ‘Apple is going to zero.’ which it is in fact not. The visualizations add a lot of panache to the documentary and are aesthetically very pleasing to behold which gives them a high show and tell value. From an information design point of view however they are underwhelming. The information density is low, it is difficult to compare several datasets and the visualizations do not offer different types of information at different zoom levels. Also: the interaction is nearly trivial. The issue of game design and game-like experiences was touched upon during the launch event to conclude that none of the makers had a lot of expertise (or even any affinity) with games. That is unfortunate because game design with its experience in dealing with highly interactive experiences of high density information spaces can add a lot to a data visualization. 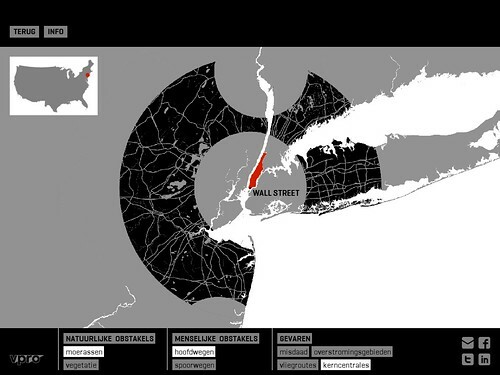 The whole issue of interactive television and how to combine a long dramatic form with visualizations (and what kind) seems to be a difficult one to solve and not the one being tackled here. As Erwin mentions in his review in Bright, added value is a highly pressing issue when it comes to traditional media trying to produce content for the iPad. That is exactly what this is: a nice packaging of a traditional television program with interactive features in a combination that will most probably remain interesting and relevant in the future. 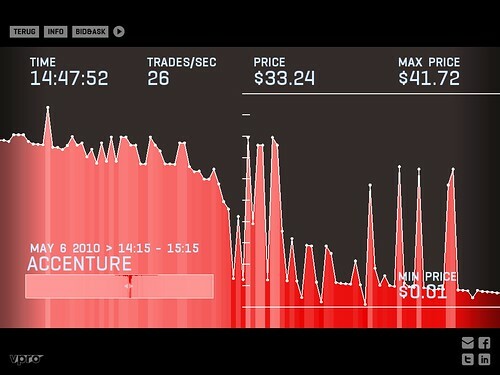 The documentary is very attractively presented on the iPad. The extra content especially is more prominent than normal when it would have been put on a back page somewhere on the website. The video playback is also one of the first cases in Dutch broadcasting where the presentation is native to the device. Another benefit is that this experiment can probably live on as a packaging format for other documentaries. The richness of the experience combined with the quality of the video, the pairing of additional content and the clear payment model make a lot of sense for something which already has high production costs. With magazines and newspapers you are adding a lot of extra weight to something that has a low margin and is ephemeral (daily, weekly). A well produced documentary such as Tegenlicht can live on for a long time and this seems to be a more suitable incarnation for that than most. The VPRO has brought forth a great release of a beautiful looking product. Tegenlicht Money & Speed is out in the App Store in a Dutch version now with an internationalized release forthcoming.